The past few years our Lean Pathways team has had the pleasure of working with software developers – a fun, capable and creative group. For some years now, the software world has been using the Agile methodology to increase throughput while reducing defects and lead time. 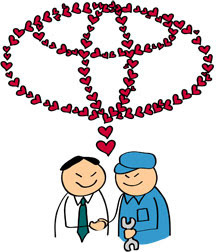 In my experience, Agile and the Toyota Production System (TPS) are entirely simpatico. In fact, it seems clear to me that Agile is a child (or perhaps grandchild) of TPS. Core TPS principles and methodologies like visual management, team huddles (scrums), rapid experimentation and total involvement are central to Agile. As you may recall, I am not interested in ‘theology’ – only in what works and lasts. TQM, TOC, BPR and Agile are all true, and all congruent with TPS. The clear and present danger for TPS/Lean, and Agile, is superficiality. A set of connected principles and methods become a Way (do in Japanese) when they connect to your deeper being. If our work is to last and attract new practitioners (e.g. Millennials) we need depth, which means connecting with TPS/Lean roots, and committing to years of practice. Thereby, we’ll attract practitioners (deshi in Japanese) who’ll further develop the Way, and attract future deshi.